As a woodworker, few things have been more satisfying than crafting my own bed frame. To feel something strong and grounded underneath me as I wake each morning is the foundation I need to start my day off right. This year I plan to make a number of furniture pieces that share equal aspects of artistry and craftsmanship, and this is the first of the bunch. 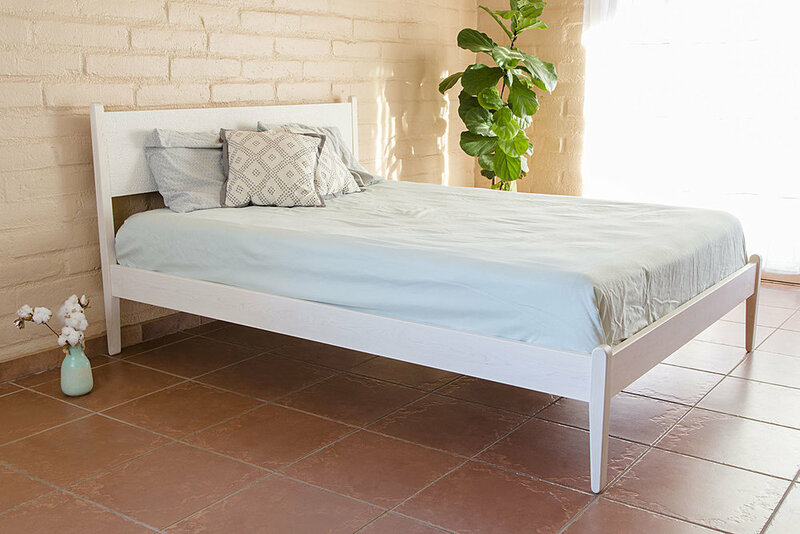 Constructed from solid hard-maple, this frame is exceptionally sturdy, constructed with traditional mortise and tenon joinery at the head and foot board. Bolt-in knock down joinery on the side rails makes for easy disassembly when it comes time to move. Lots of subtle details add up to a grand effect. Foremost, the maple is bleached, giving a light, almost paper like appearance, and the headboard is exhaustively carved, giving the frame a human touch where it’s noticed the most. The posts are tapered, and the headboard arches back ever so slightly for comfort while sitting up in bed. While I made this bed frame for my home, it’ll act as the template by which I make other bed frames like it in the future, and I plan to borrow aesthetic details from it to make other pieces of furniture next. To explore options and design the bed frame to suit your needs click the button below to see the options, or contact Kyle directly. Have you heard the news? What was once called Deoria Made is now simply Kyle D'Auria. Confused? Don't be! It's always been me (Kyle!) here behind the scenes at Deoria Made anyways, and the name change is just one of several steps I've taken in the past year to ensure I'm representing myself in my art and woodworking. For years I was honing Deoria Made very specifically into a handmade wooden kitchen goods company, mostly making heirloom quality butcher blocks and cutting boards. That narrow focus began to be limiting. From a business perspective I realized I ought to expand the business to include other skills I have, like furniture making for example, and from an artistic perspective I realized I have a lot more to express through my woodworking than just items of utility. As such I've expanded my scope, and have made room for my business to include all those things moving forward - all of me, Kyle. Art, craft and everything in between. Deoria Made has moved to Tucson, Arizona! Last month I began the process of packing up my life, packing up my business, and I moved here, to sunny Tucson, Arizona! Leaving Portland was bittersweet for my family and I, but we took time to spend our last weeks giving a grand farewell to the Pacific Northwest, which we had grown to love so much over the years. I began building Deoria Made three and a half years ago, inspired by many things Portland: The maker movement, which inspired my inner creative to be entrepreneurial and start a business that was in line with the values of this time and culture; The breathtaking Pacific Northwest landscape, and the bountiful varieties of local wood it provides; And Portland’s vibe, which demands you do what you want, how you want, for whatever reason (Portland’s famous Darth-Vader riding a unicycle playing the bagpipes guy, for example). Upon reflection, I don’t think Deoria Made could have started anywhere else; from the launching pad of the ADX maker space where Deoria Made was founded, to building lifetime friendships with other makers and businesses such as my good friends over at Portland Razor Co., to all the local support and patronage my business received from countless locals, and those I collaborated with. And since Deoria Made has such roots in Portland, and was founded upon so much inspiration from the PNW specifically, I won’t be “copy and pasting” Deoria Made PDX into Deoria Made TUS. I won’t, for example, be working with my beloved Oregon Claro walnut, because the business was founded upon working with local materials, inspired by local culture and landscape. And here, Tucson has its own equally beautiful and wild substitute for walnut: mesquite. Having grown up here, I know that Tucson has so much to offer that makes it a rich place for me creatively: The long cultural heritage and history; the strength of character that is the Sonoran Desert landscape and the plants and wildlife that reside in it; and don’t forget the monsoon season, the sunsets, and the rolling mountains that frame the Tucson valley… oh my, need I go on?? Now in Tucson, my first task is setting up shop. I’ll be spending the coming weeks moving into, and customizing a thousand square foot shop nestled into the desert landscape, just near Tucson’s Rillito River (which humorously runs dry probably 10 of 12 months of the year). I’ll be taking time to seek out and understand local materials, getting involved with the creative and artistic communities here, and knowing I’ll be inspired by all the newness, will be making plans to create new work for the latter half of 2017 and into 2018. Whatever comes of all this I’m excited to share it with you and bring you along for the journey as I explore the blank canvas I have afoot. A collection of Deoria Made Portland-made goods are still available through the website, and my stockists will still have inventory too, but these will be the last pieces of their kind as I seek out inspiration for new designs and new directions forward. A big thank you to everyone who has made these past few years in Portland such a success for Deoria Made and I, and please stay tuned for what’s next here in Tucson! It’s been quite the summer for Deoria Made! I released a new summer line of goods, The Atellia Collection, then took it on the road all the way to Los Angeles, Seattle, and even San Francisco - twice! It’s also been a summer of changes, and the biggest is set to happen next week. Deoria Made is #desertbound, as I’m moving to Tucson, AZ, where I’ll have a new big workshop to break in, desert-style. A native to Tucson, the desert has been beckoning me to come back over the years. Inspired by the landscape, and the history of the area, I can’t wait to see how the muse of Tucson and the Sonoran desert influence my work. Keep in touch to see right there along with me! In an effort to lighten my load before hitting the road, I’m having a flash sale of all Deoria Made goods! Everything, EVERYTHING, in our inventory is ½ off for 36 hours, this weekend only, until Sunday at midnight. All orders will ship Monday, or we can arrange local pickup here in Portland that day too. Design Milk, and Renegade Craft Fair have teamed up to spotlight an emerging designer for this weekend's Renegade LA fair, and Deoria Made was picked! We'll publish an account of the event afterwards, but first click the button-link below to read an interview with Deoria Made's Kyle D'Auria, by Design Milk's founder Jaime Derringer. We're excited to announce our newest product, our walnut tray coasters. They're made from claro walnut, salvaged from fallen walnut trees right here in our home of Portland, Oregon. Each coaster is cut from a a unique piece of timber, giving it a unique pattern of figure, tone, and warmth, from the rest. A soft-rounded channel is carved, making each coaster a little individual tray for your glass, mug, or tumbler. Keep an eye out for variations of the tray coaster in the near future, as we're plan a lighter color bleached maple or oak version, as well as an end-grain version. The Northwest End-Grain Butcher Block is Deoria Made's longest standing design, and its staying power symbolizes what we're all about: enduring designs; enduring goods. It came about as an amalgamation of many of our earliest cutting board designs. Over the years we've played with and changed characteristics such as the wood sourced, aesthetic proportions, and processes, but its foundation has always stayed the same. Today we dig into the archives and show some of those iterations that have led to what The Northwest Block is today. A custom commission, this end-grain butcher block was the first design that sewed the seeds of what has become The Northwest Block. After that first commission was the vision for this first stock offering. For this version walnut, maple, and oak were used, all sourced from the east coast of the United States. Next, the switch to all local materials sourced here in the Pacific Northwest! Salvaged claro walnut (sometimes english when available), FSC certified big-leaf maple, and Oregon white oak. This particular batch of walnut was quite expressive and wholly unique! Here local materials are still used, but you can see the variance from tree to tree. For example the maple in this version is much redder than the last. Also, "repairing dots" were employed. At the time much of our sourced walnut resulted in many natural imperfections, and in an effort to salvage the material in the spirit of wabi-sabi, each was bored out, and filled with cylindrical wooden inlay. A custom extra-large sized Northwest Block with juice groove upon request. Pictured here prior to pre-conditioning. And that leads us to where we are today. We're still using local Pacific Northwest claro walnut and Oregon white oak, but have made the switch back to east coast hard maple for its light color and hardness. Repairing dots have been replaced with an entirely new processing of our walnut, resulting in imperfection-free surface, where from afar the walnut looks quite abstract, but up close you can see hundreds of chevron and zig-zag patterns. We make all of our cutting boards from walnut, maple, or oak. It goes without saying that all three make excellent cutting boards; they're all hard-hardwoods, safe for food use, and quite durable. But let's take a deeper dive and learn some less commonly known information about this holy trinity of woods . . .
Claro walnut is every Portland woodworker's mascot. Though non-native, claro walnut specifically grows here in the Pacific Northwest especially, meaning we're able to source it directly from local sawyers. Rather than growing and cultivating it, these sawyers seek out fallen or damaged trees, thus the name salvaged wood. Appearance: Dark chocolate brown, with hues ranging from purple to red - sapwood is nearly white. Fun Fact: Claro walnut is planted as rootstock for walnut orchards. The more proficient fruiting english walnut is later graphed on. It's not uncommon to find lumber that displays this unity. (L) The every varying appearance of claro walnut. (R) A consistently dark chocolate brown claro walnut end-grain butcher block. White oak is strong, stubborn, and downright American. That's exactly why we like it. 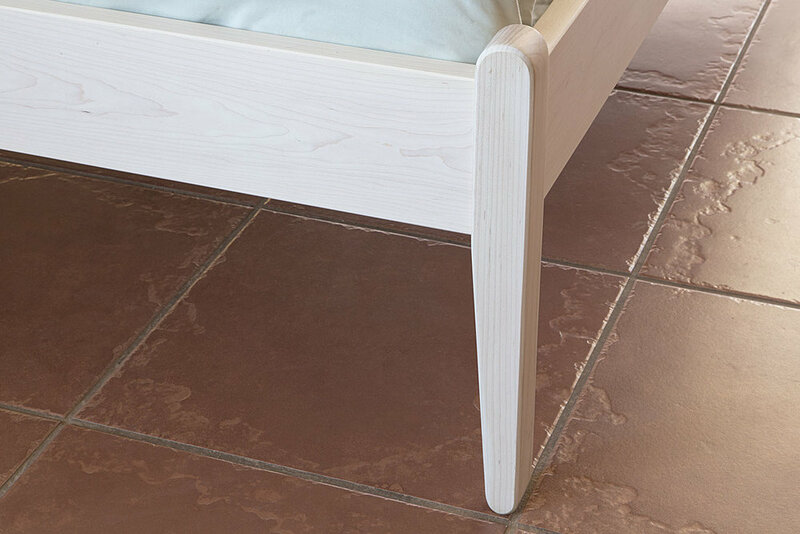 Appearance: Consistent amber-gold with quite a visual texture, even when finely sanded. Fun Fact: Nick Offerman, aka Ron Swanson of Parks and Recreation fame, and founder of Offerman woodshops was once quoted saying American Oak is his favorite wood. Hard maple, aka sugar maple is, yup, you guessed it, where your coveted maple syrup comes from. It grows mostly in the Northeastern United States. We do have a local variety of maple here in the Pacific Northwest, a particularly beautiful variety called big-leaf maple. We use it when the softer variety is needed for a project, but usually (not always) hard maple makes for a better cutting board. Fun Fact: Hard maple is the state tree of four states, New York, West Virginia, Vermont, and Wisconsin. Today we dig into the archives and take a look at a pair of custom projects we did for Wildwood Bespoke in 2015, and its sister company Wildwood & Company a year later in 2016. In 2015, Joseph Muller, proprietor of Wildwood Bespoke, commissioned a 15 foot long set of countertops for the wet-bar of his downtown Portland, Oregon tailoring studio and showroom. Offering a client a scotch while having his or her measurements taken is all part of the experience of creating bespoke suits, shirts, and sweaters for his clients. Custom to the showroom’s style, an end-grain butcher block centerpiece in walnut and maple is accompanied on either side by two curly maple tops. Later in 2016, an additional commission, the “Wildwood Block” cutting board was also developed to mirror the proportions and design of the original countertop, sold exclusively through Wildwood & Company, the boutique store that accompanies his tailoring business. We're always looking for ways to reach more customers like you! And in an effort to do so, we're now selling all of our end-grain butcher blocks direct to consumer only. They won't be sold at our stockists, instead being sold only direct to you here at deoriamade.com, in person at our workshop here in SE Portland, and at craft fairs across the west coast. Direct to consumer sales means we remove a step from our studio to your kitchen, which keeps costs down, reducing the price of our end-grain butcher blocks as much as $150! All of our other goods, including cheese boards, bread boards, and edge-grain cutting boards will still be available through our stockists. End-grain butcher blocks are, after all, our flagship cutting board. They're the first cutting boards ever made at Deoria Made, and in our opinion the be-all-end-all for chefs and home cooks. We've made this change to reach more people like you, so that you too can feel how good it is to cut on a Deoria Made surface; one that when cared for, will care for you right back! Deoria Made goods can now be found at Tilde, in the Sellwood neighborhood here in Portland, Oregon. Tilde, self-described as "an accent or extra emphasis," value small. They say "Small makers make small amounts of things, and we believe small makes all the difference." and that type of thinking perfectly aligns with us here at Deoria Made. Tilde's colorful storefront is easily spotted on Sellwood's main strip, 13th Ave. There you'll find our walnut cheese boards, trapezoid bread boards, walnut edge-grain cutting boards, and many other great brands, including local Deoria Made friends + favorites Molly Muriel, and Relm Studios. Stop by and say hi! Resourceful chefs make a habit of wasting as little as possible. Frying bacon leaves a lot of grease behind, which can be used to cook the rest of a breakfast hash, saving any butter or other type of fat that would otherwise have to be reached for. A pastry chef uses fresh blueberries atop a tart, but once they’ve lost their healthy look they don’t have to be discarded, and rather can be baked into a dish where their ripeness can be appreciated. At Deoria Made we have the same mentality. For example, offcuts from our various projects are saved, cut down to size, and turned into the feet for our Blocks; Other small sections of wood that are too small to include in a piece of furniture or larger Block cutting board are saved and then turned into small cheeseboards. Bug dammage was exposed during the milling process of this cheeseboard, which was easily amended with a strip of walnut. Scrap material used as feet for our Blocks. We also don’t shy away from imperfections. Most of our work is produced in batches, often leaving a board here or there that is not quite the same as the rest. We constantly find new and creative ways to resurrect these imperfections. For example, knots are filled with plugs, making for an interesting dotted pattern; A cheeseboard that came out of the milling process too narrow for stock gets a piece of contrasting wood added to it, and it becomes a new piece. These pieces become our One-of-a-Kind models, which are inspired by the idea that imperfections are perfect. Whether it’s cooking, woodworking, or any other facet of life, being resourceful is not only personally beneficial in that you consume less or perhaps pay less, but also socially and environmentally responsible in that you decrease your impact on the planet. Using a heaping cup of creativity, a tablespoon of critical thought, and a pinch of patience, most materials can be saved from the trash bin and can be turned into beautiful things you’d initially never imagined. Try it, you’ll surprise yourself! Cutting Boards | Why Wood? Growing up, my Mother’s cutting board was the centerpiece of the kitchen. It was big, thick, and took up some serious kitchen real estate! It stood proud, almost like a piece of furniture, and was the surface that she used for all food preparation. She’s had other small boards, like plastic for mincing garlic, slate for serving cheese and crackers, and a few others, but for the most part they just gathered dust beneath the countertop. The way my Mother uses her cutting board follows a long tradition of people before us using wooden cutting boards– from a butcher cleaving meat day in and day out on a two foot thick butcher’s block, to a grandmother in Italy preparing tortellini for her grandchildren, people have been cooking on wood forever. And for good reason; wood is an ideal cutting surface to retain a knife’s edge, it’s antibacterial, it can be conditioned and resurfaced, and in the case of an end-grain cutting board it “self-heals” marks left behind by knives. A conditioned, well cared for Deoria Made block in the wild. My Mother's in fact. It is commonly known that plastic can be run through the dishwasher (wood cannot), leading most to believe that it is a more sanitary cutting surface. Wrong! Less commonly known is that wood is naturally antibacterial. A study by UC-Davis researched the difference between plastic and wood, specifically measuring how long bacteria persists on either surface once “scarred.” Scarred surfaces are areas where cleaving, chopping, or serrating has created a marred surface. Interestingly, they found that bacteria would die on or under scarred wood surfaces. However bacteria on or under scarred plastic surfaces would persist. This means that no amount of scrubbing, sanitizing, or dishwashing is enough to rid plastic of deep infections such as bacteria. The impetus for UC-Davis’s research was that The US Department of Agriculture had no scientific evidence to support their claim that plastic is more sanitary than wood. But, alas, we have scientific proof! So the next time someone tells you plastic is more sanitary than wood, call their BS! High five skeptics, we were right all along: Wood is king! Besides the cleanliness, wood is an ideal hardness to cut on. An ideal harness is something like the local Pacific Northwest claro walnut, big leaf maple, or oak we use, where it’s hard enough to resists knife marks, but soft enough to retain your knife’s edge. Some woods, like ironwood, are just too hard for that. Regardless, scarred wood is re-surfaceable. Scarring can be managed and kept to a minimum by regular wet-sanding, or all together eliminated by complete resurfacing – plastic cannot. Additionally, the end grain of wood, which features as the surface of all of our Deoria Made Blocks, actually heals itself. It is “self-healing.” Imagine for a moment a paint brush pointing up, with the bristles held up vertical. Then take a knife and cut down into the bristles. When you pull your knife out, those bristles spring back together. They self-heal so to speak. That is how the end grain of wood is oriented, and that is something plastic simply does not do. Thanks to “The Wood Whisperer” for that great paint brush analogy by the way. Okay, but what about conditioning. Certainly a convenient benefit to plastic is that you don’t have to treat it. Well, to that I say, conditioning is much easier than you think, and it’s like anything, like, say a pair of leather boots – the more you condition them, the better they’ll be and the longer they’ll last. A properly conditioned and cared for wooden cutting board can last a lifetime, whereas a plastic board you simply throw into the landfill when it’s done. A simple coating of mineral oil, and a top coat of the Deoria Made Cure-All is all you need once in a while to keep yours in tip top shape. Conditioning it this way actually helps it resist smells, flavors, and colors of the food your chopping, so it’s all around a good thing. To conclude, wooden cutting boards are the best! My Mother had it right, and so did your Mother’s Mother’s Mother’s Mother (I could go further but won’t). It’s not only been tested that wood is a more sanitary surface than plastic, but it’s also more durable, ideal for your knife’s sharp edge, and also just straight up awesome. I mean, it grew from a tree, a lumber mill salvaged that tree (did I mention we use salvaged wood at Deoria Made), and now it’s sitting atop your countertop looking beautiful. What more could you want? References: If you’d like to read more about UC –Davis’s research, publications include “Cutting boards of plastic and wood contaminated experimentally with bacteria,” “Decontamination of plastic and wooden cutting boards for kitchen use,” and “Cutting Boards up Close,” by Dean O. Cliver, Ph.D.
“Farm-to-table” is an expression we hear a lot these days, describing food that is delivered to you with few, if any, middle men involved in the process. More than an expression though, farm-to-table is a movement that encourages us to know our farmers in order to know where our food comes from. The concept is that if we know who grew our food, we can also determine how it was grown, cultivated, and delivered. That knowledge allows us to decide whether the ethics of the farmer align with ours. Farm-to-table is not just some abused pop-culture term; instead it is at the forefront of a revolution in which people care about all aspects of what they consume. Farm-to-table advocates are conscious. They’re wondering where the produce on their dish came from, whether or not it was treated with chemicals, or even what type of irrigation was used to grow it. They care not only about the taste of the food, but also what implications its production has on the environment, or perhaps workers' conditions. It’s all about care. Caring about what we support in this chaotic consumer world, and what we choose not to support. They’re navigating the dense, dark, and confusing world of consumerism that we all partake in. And that’s courageous. Out of respect for farm-to-table, I’ve done my best to apply its principles to how I operate Deoria Made. When I began woodworking, I didn’t concern myself much with where my lumber originated, how it was cultivated, or what my purchase supported - I didn't know any better. But when I shopped at a lumber store which seemed to know very little about the life of the lumber they stock, I felt as though I was shopping at a big box store like Wal-Mart. The whole experience was lacking and left me feeling hollow as a result. As it turns out, many types of lumber internationally and even domestically degrade the forests from which they come, and sometimes even degrade the local economies they come from. Not to mention, these woods have to travel across the country, or perhaps even across the world to end up in the workshop. There’s nothing about that journey that makes me feel all warm and fuzzy inside. Learning this, I began looking into local lumber, and haven’t looked back since. “Local” was the first requirement I implemented into my new way of thinking, because the fewer resources it takes to get to my workshop, the better for the environment. In the same way that it doesn’t make sense to have strawberries shipped from another country when excellent strawberries are grown locally on Mt. Hood just outside of Portland, it didn’t make sense to have lumber shipped thousands of miles when we have great, and even sometimes superior lumber in our Portland backyard. The further I explored, the more I found that some lumber is “salvaged” rather than cultivated. That is to say that rather than growing trees for the sake of cultivating lumber, salvaged material is “saved” from the wood chipper. This just kept getting more awesome, and aligning more and more with my ethical ideals. I also found that if a particular species of lumber wasn’t salvaged, that it could be certified by the Forest Stewardship Council (FSC) which “ensures that products come from responsibly managed forests that provide environmental, social and economic benefits.” After learning about all these things, woodworking became much more interesting to me, realizing that by woodworking I could be doing much more than just making nice pieces, but I could also be supporting good causes such as the local economy and the environment. The company truck, affectionately called Bruiser, loaded up with large slabs of claro walnut from Goby. A custom Deoria Made big-leaf-maple block with claro walnut dots. BLM can often have much more character than other maples, and this batch was no exception. Goby Walnut was one of the first businesses I aligned myself with in this new chapter of Deoria Made, and they continue to be one of my favorite places to buy lumber in Portland. They have two of their own sawmills, five dehumidification kilns, and four vacuum kilns to dry their lumber. Needless to say, they are a major institution in the Pacific Northwest. While they specialize in claro walnut, they also stock big leaf maple, tan oak, madrone, ash, myrtle, and a score of other hardwoods, 90% of which comes from our home, Oregon. The other 10% comes as far east as Idaho, and as far south as Sacramento. They save so many trees from the wood chipper that they even wholesale to other lumber stores in the PNW. If you haven’t gone, go! I’ve said it before and I’ll say it again, it’s walnut-Mecca. For me, it’s an amazing treat to learn these details about the wood I use for Deoria Made. I love hearing a story about where a particular batch came from; that perhaps a home owner’s walnut tree in their back yard was beginning to die as a result of twig beetle damage, and that Goby came to the rescue, saving it from the wood chipper. This stuff matters. These details matter. The business is also run by a father son duo, and the knowledge of anyone working there is just amazing… but that’s just icing on the cake. At this point, Deoria Made items are almost exclusively made with local materials. It's a great feeling knowing that it’s salved, or FSC certified, and I like heading into the store to hear intimate stories about where the slab of wood I’m about to buy came from. When I do use non-local materials, its either because a customer requested it, or because I came upon some second-hand. But if you’ve ever seen or worked with local claro walnut, or any of the other luscious hardwoods we have here in the Willamatte Valley, you’ll know they’re to die for. And why not use them? They’re sitting right here in our backyard, just waiting for the wood chipper, or perhaps a woodworker to honor its beauty, and make something useful out of it. That's how we do it at Deoria Made, and we hope others follow suit.